I make this amount once a fortnight, use one loaf and freeze the other two. It takes just under 10 minutes to both mix and knead the dough, after some practice! Grease 3 large loaf tins in readiness. 1. Put the flour[s], salt and bran into a large mixing bowl. Add the Flora or lard and flake in thoroughly with your fingers. 2. Add the sachets of yeast and mix in thoroughly. 3. Make a well in the centre, pour in most of the warm water. Mix thoroughly with a wooden spoon until it starts coming together into a large lump. Add the remaining water as required until you have a soft, pliable dough. 4. Turn onto a floured surface and knead for a few minutes – until the dough feels ‘elastic’ and is rounded in shape. 5. Cut into 3 even-sized pieces, and knead each for 2 – 3 minutes before shaping into loaves. 6. Make 3 cuts in the top of each one, and place in the tins. 7. Put into a warm place until they have doubled in size – just over an hour should be enough. 9. 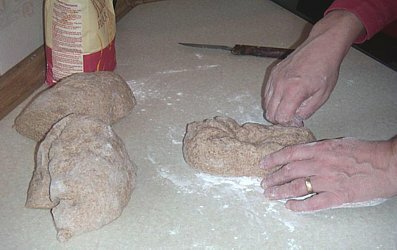 Test by tapping each loaf on the bottom – they should sound hollow. Leave to cool on a rack. Tips: Warm the flour in a microwave for a few minute on a low heat – this makes the bread rise faster. 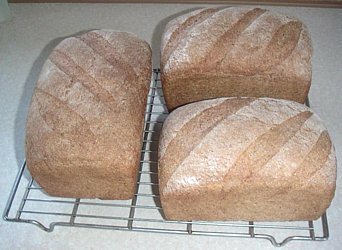 Also, put the loaves to rise in a warming cupboard / 2nd oven, or in a closed oven which is slightly warm. This decreases the rising time needed, and gives the loaves a ‘kick-start’!